Sharmila Desai was raised between Southern India and the East Coast of the United States. From birth she was exposed to spirituality, selfless service, music, dance and non-materialism through her matrilineal family of renowned Indian classical dancers and intellectuals. Sharmila practiced yoga before it was considered "cool" and as an undergrad at Columbia University, she received a human rights grant from Columbia University to travel to Mongolia and China to research the possibility of establishing women's centers. Post-graduation, she was awarded the Henry Evans Fellowship to set up an Indian dance program for street girls in Mumbai. From there, she traveled to Mysore, began her Ashtanga yoga studies in ernest and in 2014 she published a book on yoga for mothers and pregnancy. 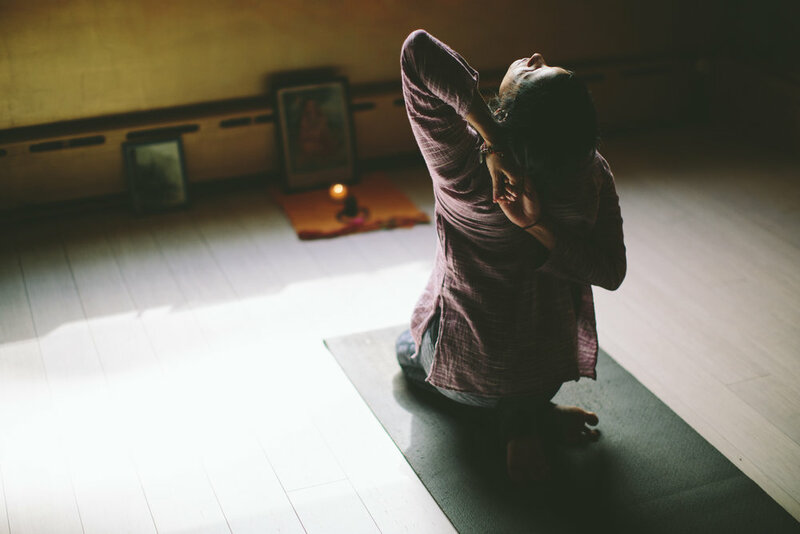 In 2017 she, her husband and two children left upstate New York, returning to her family's ancestral land in Goa where she teaches Mysore-style Ashtanga yoga from her home shala, nestled among the coconut trees. In the words of Sharmila, "the learning never stops." INSIDE/OUT: Please share your genesis story. Sharmila Desai: My grandmothers were vibrant Indian women of great personal strength and creativity. They taught me from a young age that I should trust myself, work hard and spiritually evolve as a human being. Hima Devi and Krishnabhai applied all of themselves in overcoming obstacles to fulfill their life endeavors. At the same time they interacted with life on a subtle level feeling joy in the quiet personal moments and valued non-materialistic simple living. Without being aware of it, my time with them impressed upon my own journey through life, especially when I went against the norms to study yoga at a time when the tradition wasn’t a part of mainstream society the way it is today or give my children water births at home when it wasn’t common in our family community. My grandmothers were both devout as well as selfless, performing morning home pujas and helping others ceaselessly. It was in their blood cells and in their hearts, a part of who they were. In my own way, I try to give without expectations to all living beings around me as a central philosophy starting with my children, expanding to practitioners who cross my path, animals in need and to our earth. I/O: Tell us a bit about what you are doing and how. SD: When I look for something that I am seeking and it doesn’t exist I create it. When I became a mother I was searching for information about how to practice Ashtanga yoga for conception, pregnancy, birth and postpartum. There was very little available. I depended on midwife Ina May’s book Spiritual Midwifery as well as turning to the knowledge shared in the Kundalini and Iyengar yoga traditions. This experience inspired me to write the book Yoga Sadhana for Mothers - a co-creation with one of my best friends Anna Wise who is a mother, doula and yoga teacher herself - to serve other women going through the rite of passage. My experiences as a yoga practitioner taught me to be unafraid when asking some of the deeper questions in life. After giving my children natural births, I eventually asked in what environment I wanted to raise them. Asha my daughter is 10 and Arjuna my son is 8. Empathy, non violence, embracing different traditions as well as natural rhythms were all concepts I wanted the children to understand on a foundational and visceral level. Moving back to my parents’ village in India immersed in nature with intermittent wifi and working at the local animal sanctuary seemed like the right move to make even though it was a leap. Their best friends now are books, animals, the ocean and each other. Each morning after I finish my own practice in the pre-dawn hours, I teach Mysore-style Ashtanga yoga at our home shala which is nestled amidst coconut trees on our family’s ancestral land here in Goa. The class is almost entirely in silence as students move through their individually prescribed yoga postures using their breath as the thread. Practitioners from age 10 to 70 join from the local community as well as from other places in the world. There are also those who come here from other schools of spiritual inquiry in India such as Sri Aurobindo’s Auroville in Pondicherry and a Vedantic Society in Kerala. Later in the day I am often gardening, planting local trees, flowering plants and herbs with my children. Helping the environment is at the top of Asha and Arjuna’s list. They are keen to act and uplift. This is our way to say thank you to the earth together. Practicing yoga allows me to experience how life and all of what inhabits it is interconnected. My dream has always been to have a shala dedicated to the Ashtanga yoga tradition in a place that nurtures practitioners to experience a whole spiritual ecology in their search for truth. It took many years of hard work to build the structure as well as cultivate the surrounding area and we faced at times seemingly insurmountable challenges on the way which has made us appreciate its existence deeply. I look at the shala and my purpose in life as works in progress continually growing through study, insight and experience. I/O: What are you working on now or dreaming of doing in the future? SD: A life by example. Building a cow shed next to the shala for four of the rescued calfs who have lost their mothers that we are currently hand feeding. A project to empower young girls and single mothers at the Women and Girls shelter nearby. A few book projects on yoga, women’s health, longevity and sadhana (spiritual practice). Next year we hope to travel with the children through the Himalayas during our free time. I/O: How many of your students are girls or women? SD: Interestingly, my shala draws in almost as many men as women and also of varying ages. When I travel to share what I know a lot of women come to see me - young girls, teens, women that are pregnant, women that are not pregnant, women from the ages of 60 to 75. I grew up watching my grandmother practice and my first Ashtanga yoga class with Sri K. Pattabhi Jois had a 10 year old girl in it. Inherent in my understanding of the yoga tradition is that it embraces all stages of life. Our hormones, cycles and biology have to be considered as we move towards self-harmony. I am constantly studying what this means exactly and try to both embody and impart the knowledge absorbed. SD: Women bring life into the world. We are at the very least equal. Empowering women on their journey to become conscious mothers is a way to bring peace and happiness into the present and future world. We must strengthen our girls through education and health and at the same time mold feminist boys so that we change the entire ethos of how we respect one another. Yoga offers us a way to see oneness. An understanding that there is no separation between one person and the next, between all living beings. This principle applies to gender, sexuality, race, class, caste, religion and completely permeates our vision. Our duty is to be together in the daily work of building equality across society so we live in a world that values tolerance, education, compassion and human kindness. SD: I admire: Jane Goodall, Malala, Mahatma Gandhi and my teachers were: my grandmothers, Guruji, Sharath Jois, Saraswati Jois. Also, Atul Sarin - the founder of WAG - Welfare for Animals in Goa. Every day he rescues animals and gives them medical treatment if need be and a loving home. I have learned so much about Ahimsa in action from him. And Trudie Styler - I lived with Trudie and her family for several years teaching yoga. They are all family to me. The irony is that even though I was teaching yoga to her and Sting they taught me so much by example. Trudie showed me how to create a loving home, grow organic food from the soil, how to give back and the importance of fulfilling one's true potential with fearlessness. What I learned from her resounds poignantly year after year. SD: The belief that the learning never stops. My parents, husband and children. Education and my role models. I/O: Overall, who takes care of you? Who or what makes you stronger? SD: My yoga practice takes care of me - internally as well as externally - giving an abundance of energy and flow for motherhood, seva (selfless service), practice, teaching, to do what is right. SD: We face challenges every day here - sometimes there is no electricity, no running water, stomach bugs and intermittent wifi...or never a strong enough connection to download anything. Off season, all of the stores shut and we have to travel quite a bit just to find a hardware store. It is these very "inconveniences" that have helped us slow down, watch the sun setting, immerse deeper in practice, read books for hours, visit neighborhood temples, be together barefoot in nature and create lifelong memories. I now expect challenges and knowing this truth allows me to live in the present moment more. I/O: What particular challenges do you find women are facing and how can this be improved? SD: I work with a lot of women who experience a dissonance that stems from being disconnected to their natural rhythms and cycles manifesting in myriad ways. Sometimes it is stress related and other times it could be something from the past that has risen or else perhaps having too much of a masculine approach to practicing. When women listen to their bodies' inner wisdom they are able to lead a more whole and joyful life. Only through transforming the relationship we have with ourselves are we able to create the lives we seek in the outer world. For women this includes understanding and honoring how our biology functions so we can tap into a ceaseless flow of energy and internal resilience. I/O: What would you recommend for people without the means or geographical access to prestigious materials, products and practitioners? SD: We only need ourselves for yoga. We have our body, our breath, our mind, our spirit to practice and experience this spiritual science. Spend quality time with a real teacher and then develop a home practice. You can bring your practice anywhere you are and allow it to fill the rest of your life. SD: I was raised as a traveler. My parents took us on adventures across Asia to remote areas with little supplies. My world expanded a thousandfold through travel and I was able to witness that there is a universal human thread that binds us all even if we exist in different cultures. Two trips that have stood out the most is when I received a Human Rights grant from Columbia University to visit Inner Mongolia and the rainforest in Southern China to research the possibility of setting up a women's center both in the desert as well as the mountains. The other a personal journey trekking through the Himalayas on my own. I've been to Nepal, India, Thailand, China, Malaysia, Indonesia, Saipan, West Africa, Morocco, France, Italy, Spain, the U.K., Netherlands, Canada, Guatemala, Brazil, Nicaragua, Costa Rica, Belize and probably some others. Right now I love being in India. I would like to backpack with my children to explore some undiscovered nature areas of the country. SD: Being with the rescued calves at Welfare for Animals in Goa with my children and students. Watching the sun set at the end of the day and contemplating on the great source that it is. SD: Take a deep breath and then see if I can be a part of the solution. SD: In Morjim, Goa, India. And online here. Yoga Sadhana for Mothers is the first book dedicated to the subject of Ashtanga yoga, pregnancy, birth and motherhood. Written with the blessing and support of the late yoga master Shri K. Pattabhi Jois's family, this book offers the guidance, shared wisdom and practical tips that every student and teacher of Ashtanga yoga needs for the journey into motherhood and beyond.